This very spacious apartment which is furnished in a typical Italian style is part of an enclosed area with a total of 17 apartments in 3 buildings from the 14th century. The area is fully restored, without losing the medieval atmosphere however. The apartment comes with a private patio en beautiful beamed ceilings. You will be sharing the large pool with loungers, a tennis court (can also be used as a basketball court or soccer field), a table tennis table, a barbecue, a laundry service and a couple of mountain bikes with the other occupants. The apartment is at a distance of just 9 kilometres from Rosia; in this cosy little town you can get your daily groceries. The beautiful natural surroundings are great to see, and easily explored on foot or by bike. 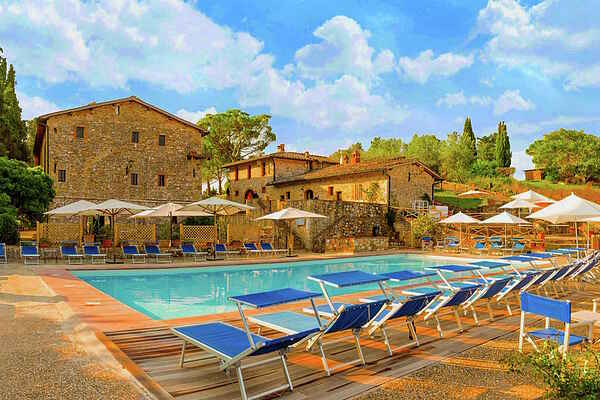 The estate is very centrally located in magnificent Tuscany. It is, for instance, right en route to Siena (25 km) and San Gimignano (33 km). Both cities are medieval and great destinations to visit. San Gimignano is also known as the tower city, thanks to the 14 towers clearly visible above the center of town. All that history and the lively terraces make these cities great recommendations for a visit.